BEAVER ISLAND-Long known for its excellent largemouth bass and bluegill fishery, Beaver Island’s Lake Geneserath is destined to become an angler’s hotspot for another popular game fish species-walleye, thanks primarily to the work of a dedicated group of sportsmen and women on the Lake Michigan island. 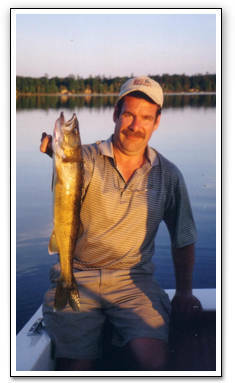 “Offering both the residents of Beaver Island and our seasonal visitors another recreational opportunity, especially something that would offer additional off-season fishing opportunities, has been a dream of the Beaver Island Wildlife Club since 1991,” said Jeff Powers, president of the sportsmans group. “It looks like that dream is finally coming true,” he said, grinning, as he held up a beautiful 23 inch walleye, estimated to be four years old. The group has raised and successfully released more than 15,000 walleye fingerlings since the pond’s inception. A recent warm, calm night on the quiet semi-wilderness lake produced more than a dozen eager fish in less than three hours, most in the 16-18 inch range, as well as the larger 23 inch fish.